If you follow me on Twitter, you probably know that I’m excited for the opening of Artisphere this Sunday! This new art space promises ‘to showcase an eclectic mix of thought-provoking, weird and wonderful arts activities.’ What more could you want? If you’re relying on the Blue/Orange line, you’re out of luck since Metro Center, McPherson Square and Farragut West are all closed this weekend. But if you live in the Logan Circle area like I do, you can take the Circulator from Dupont straight to Rosslyn. My parents and little bro are in town this weekend so I’m missing out on a couple great workshops here in DC so do me a favor and go to them! 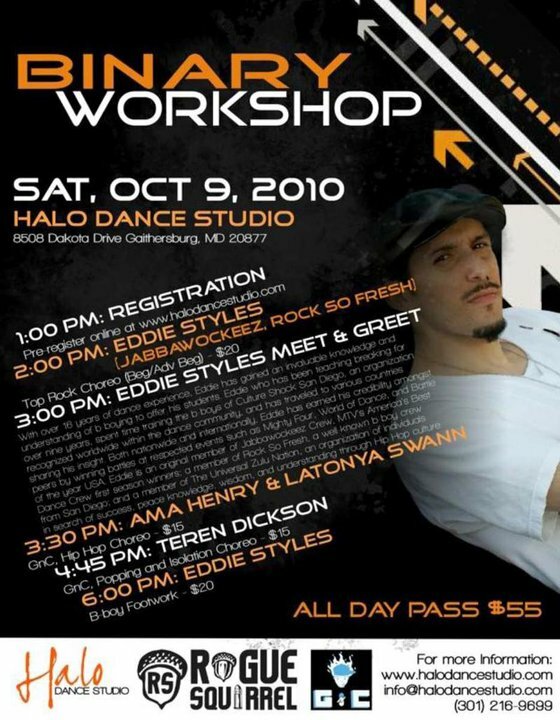 Binary Workshops featuring Eddie Styles at Halo Dance Studio (my tweep Teren Dickson will also be teaching) on Saturday and Luam at Joy of Motion/Friendship Heights on Sunday. If you attend and want to guest post, hit me up. Hopefully see some of you at VelocityDC tonight at Harman Center for the Arts. Enjoy your weekend and keep dancing!